Posted on May 25th, 2017 in Event PR,Experiential Marketing,Film PR,PR Stunt,PR Stunts,publicity stunt agency,Publicity Stunts,Stunt Of The Day,Taylor Herring News,Taylor Herring PR. Tourists and visitors to Britain’s coastline were left stunned today as they stumbled across a series of pirate sculptures emerging from the sea. The pirate statues were spotted on Brighton Beach, at Birling Gap and the Seven Sisters in Eastbourne and at HMNB Portsmouth Harbour. The unique art installation has been unveiled by Walt Disney Studios to launch the new film ‘Pirates of the Caribbean: Salazar’s Revenge’, which opens in cinemas today. The sculptures were installed under the cover of night and were revealed at low tide the following morning. The two-metre-high statues portray the new characters from the film – the crew of the fearsome Spanish pirate-hunter Captain Salazar (played by Javier Bardem) and his shipmates Magda and Lasaro. The figurines specially commissioned by Disney, stunned dog-walkers along Eastbourne’s iconic Birling Gap and the Seven Sisters chalk cliffs. Beachgoers enjoying a spot of sunshine were given a surprise on Brighton beach, whilst Naval officers and fishermen at Portsmouth Harbour looked on curiously as they spotted the sculptures bursting from the sea. The figures were created by a dedicated team of sculptors who took six weeks to build the swashbuckling statues. The intricate designs were painted and sculpted by hand, featuring life-like attributes with flowing hair and accurate costumes from the film. The fifth film in the Pirates of the Caribbean franchise, Pirates of the Caribbean: Salazar’s Revenge follows the legendary Captain Jack Sparrow, as he returns to the seas to face his old nemesis Salazar, a pirate captain who has escaped the Devil’s Triangle and is determined to kill every pirate at sea. Captain Jack is joined by old and new acquaintances to help him on his latest quest to find the powerful trident of Poseidon. Pirates of the Caribbean: Salazar’s Revenge is released in cinemas nationwide today. Posted on November 23rd, 2016 in App PR,brand PR,Consumer PR,Online PR,PR Stunt,PR Stunts,publicity stunt agency,Retail PR,stuff we liked,Stunt Of The Day,Technology PR. Yesterday, hundreds queued down New York’s Fifth Avenue, eagerly anticipating the opportunity to ‘snap up’ Snap Inc’s new Spectacles, the must-have piece of tech this winter. Having announced only on Monday at 6am that in 24 hours New Yorker’s would have the chance to purchase the glasses, the anticipation was understandably high, with hundreds queuing for hours to purchase a pair. Joining the qeuers was Paul Marcum, president of Truffle Pig – the joint advertising agency owned by Snapchat, WPP and Daily Mail – reflecting the idea that Snap Inc. had created a highly desirable (not to mention exclusive) product. Furthermore, this proved an opportunity not to be missed for those who wait in queues for a living – and, as expected, they came prepared. 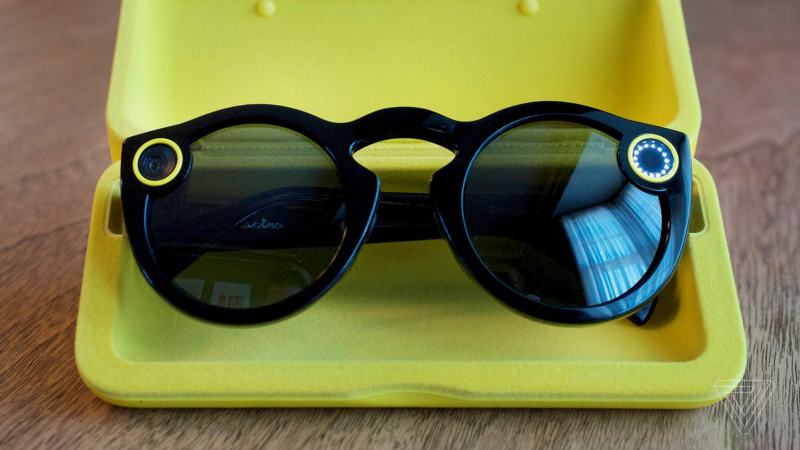 The Spectacles are, essentially, a pair of sunglasses with a camera inside – what’s cool about them is that they shoot unique circular video, and are linked directly with the Snapchat app. They are retailing for $129.00 (roughly £100) each, with restrictions meaning ensuring that customers only buy two pairs each – clearly a necessary precaution, given that pairs have since been selling on eBay for up to $1000. The specs were first unveiled on Friday, November 11 at Venice Beach – the location of Snapchat’s former office headquarters. Snap Inc. have ingeniously used a vending machine-esque bot to distribute the glasses, which is covered by curtain and then restocked in each location as required. Snap Inc. began by placing billboards, some without branding or wording but just the distinctive eye logo. This increased speculation nationwide as to where the next bot would be, with hopefuls optimistically predicting that the next pop-up would be in their region – from New York’s Times Square to Cleveland, Ohio. Whilst the decidedly rural drop-point of Big Sur, California led to much confusion amongst Twitter users, it was then confirmed by a retweet from Snap Inc. that it was at Big Sur that Snap’s CEO tried the specs out for the first time – and knew they were onto something. Snap Inc. have been incredibly successful in launching their the Spectacles, not least because of their clever marketing strategy which has allowed a buzz to develop, and carry on developing, around an exclusive product. We look forward to seeing what Snapchat come up with next! Posted on June 15th, 2016 in PR Stunt,publicity stunt agency,Publicity Stunts. LONDON, Wednesday 14TH JUNE 2016: The agency behind some of the most exciting, and disruptive pieces of stunt marketing of the last 15 years will be discussing the art of the publicity stunt this Saturday, in a special keynote at Cannes Lions. In “Zen and the Art of the Publicity Stunt”, Taylor Herring’s creative directors James Herring and Peter Mountstevens will be exploring where publicity stunts and viral marketing can cut through where conventional advertising fails. The London-based agency has become renowned for attention-grabbing campaigns that capture the imagination and hit the headlines. The session will brand storytelling in its most potent form – drawing on insights from the likes of Donald Trump, Greenpeace, Richard Branson, Red Bull, AirBnB and Uber. This unmissable session is set to feature a stunning appearance from a life-like, 8ft, adult Polar Bear, controlled by puppeteers from the West End Musical War Horse. The award-winning bear was the centrepiece of a campaign created by Taylor Herring for British TV channel Sky Atlantic. Those who can’t attend the special presentation this Saturday afternoon will still have a chance to meet the remarkable bear in Cannes this weekend, as he will be prowling the beachfront and the Croisette through the course of the festival.